I'm a big fan of Jack Kirby, and some of the more fun parts of the King's legacy have always been those moments where he shows up within the comics and cartoons that he had a hand in shaping. Over the years, Kirby has been denied admittance along with Stan Lee to their creations' wedding in Fantastic Four, appeared as a floating head made of pure creative force in Alan Moore and Rick Veitch's Supreme, and even showed up again in the pages of FF, in the role of, well, God Himself during Mark Waid and Mike Wieringo's run. And then there was the time that Jack Kirby rented a basement apartment from April O'Neil and teamed up with Donatello the Ninja Turtle to fight an army of monsters brought to life by a magic crystal that he taped to his pencil in another dimension. 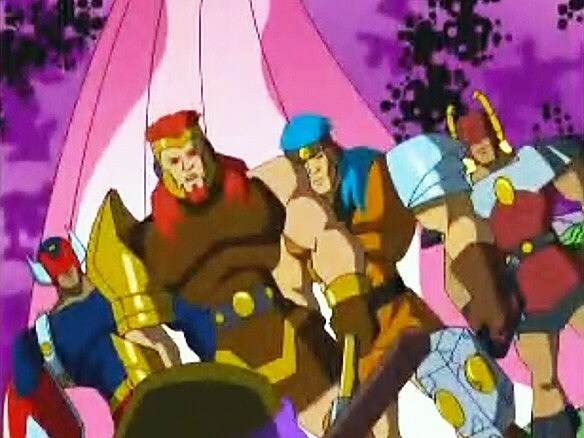 That one was a little weird.The idea behind the crossover first cropped up in a story from Donatello #1, but it made it to TV during the first season of the 2003 Teenage Mutant Ninja Turtles reboot, in an episode that was appropriately titled "The King." Even though I'm a pretty big Kirby fan, I'd never heard of it, largely because -- aside from the truly bizarre TMNT anime that I covered here at ComicsAlliance -- the last episode of TMNT I watched was on a VHS tape that I got from Pizza Hut when I was nine. Fortunately, someone uploaded the episodes to YouTube, and when Chad Bowers stumbled across them, he passed them on to me. All he told me before I watched it was that it was a Jack Kirby/TMNT team-up, but really: Is there anything that could possibly make that sound better? 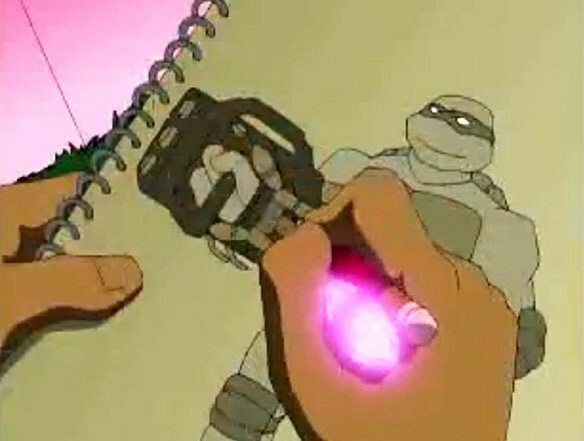 DONATELLO: Being a Ninja Turtle, I've seen a lot of crazy things over the past few years. That kind of understatement just doesn't come along every day, especially spoken by a six-foot tall talking turtle who had been trained by a rat in the ancient arts of assassination and espionage. The fact that he is even capable of being surprised at this point is a testament to his enthusiasm. Aside from that opening sequence where Donatello is facing down an army of "weirdies" in what appears to be Asgard, however, things start out pretty slow. There's a lot of hanging out at April's apartment, talking about how they fought the Shredder before, and, in the single most shocking moment of the episode, ordering Chinese food. Chinese food?! And not pizza?! Get your filthy hands off my childhood, TMNT reboot! 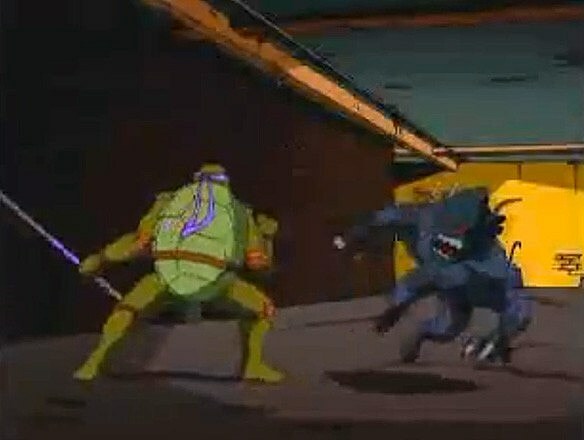 After attacking, the monster vanishes, leaving Donatello alone in the hallway. Clearly, this bears investigating, but when Don starts poking around, all he finds is the basement apartment and its lone occupant, drawing on a sketch pad. As he draws, though, his creations come to life and leap off the page, lasting a few minutes before vanishing. This is the only episode I've seen so I don't know if magic crystals are a recurring plot element in this show, but I can definitely tell you that this is never once addressed or explained after this single mention. Apparently Kirby was just hanging out one day, found a glowing chunk of rock, and decided to tie it to his pencil with a piece of string and set about drawing some monsters. You know, as one does. Now, those of you who are fans of the TMNT franchise may recall that while his fellow turtles are cool but rude and/or party dudes, Donatello is -- in theory, at least -- the smart one. 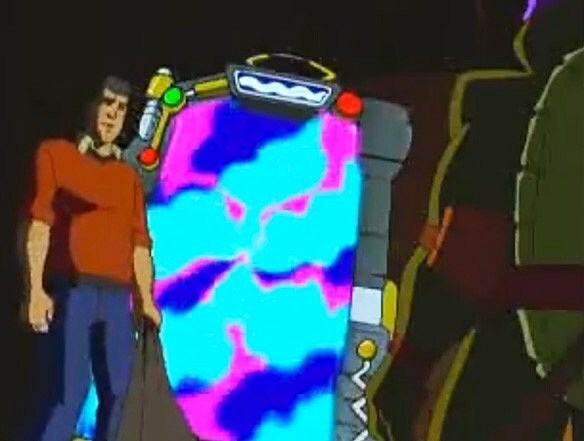 So of course, when he's presented with a strange doorway with completely unknown properties, the first thing he does is just walk right through it. The second thing he does is tell the old man with a sketchbook to come through after him. The bad news is that those monsters aren't exactly friendly, and to make matters worse, Kirby has drawn an awful lot of them. There's even a gag in there about Kirby being so prolific that mirrors his real-life counterpart's ability to write, draw and edit an entire comic book every two weeks back in the '70s that I thought was a nice touch. 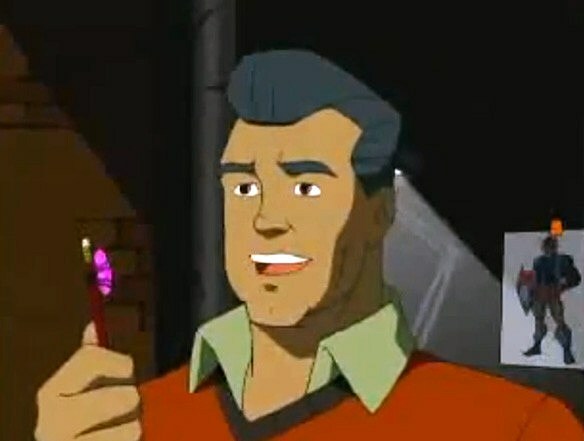 Seriously, why that dude with the flat-top mullet has not returned to comics, I will never understand. Since the time Kirby didn't spend on designing more heroes was spent filling Fake Asgard up with adorably imperiled children, Donatello agrees to fight alongside the heroes to save them. The thing is, though, even with the skill of a nerdy amphibianinja on their side, there's just too many monsters. That's why Kirby has to jump in. Even though the rest of us arrived at this point about eight paragraphs ago, Kirby eventually reaches the conclusion that in this world, his drawings can become reality, so he gets to scribbling, and again, it's pretty awesome. 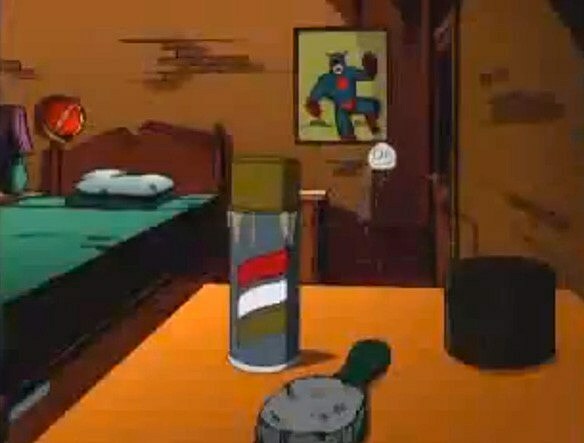 The first thing he does is give Donatello "A 'GRAVITY EQUALIZER!!' IT CANCELS 'THE GRAVITY EQUATION!!" And he follows that up with a "MOBILE CREEP TRAPPER!!" that looks like it would've fit right in with the toys Jack Kirby was designing in the '80s. It's still not enough to turn the tide, though, until eventually Kirby decides to go through his sketchbook, modifying all the drawings of monsters to add chains, blocks of ice and various other restraints. It's a pretty neat idea, especially in that it's a literal version of creativity winning out where violence can't help, but honestly, you'd think lettering in "I'm Nice!" over each of their heads would've been a better way to go about it. Then again, I guess Artie Simek never found a magic crystal. With the battle won, Kirby and Donatello head back to the portal to return to New York, only to find that it's shrinking. 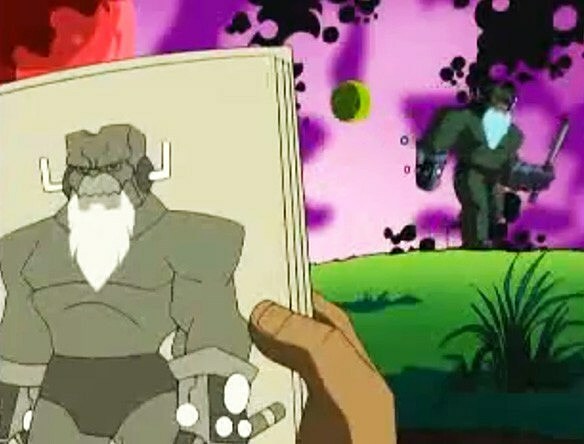 Kirby shoves Don through just as it winks out of existence, sending a page of his sketchbook with his drawing of Donatello through with a note adorned with one of Jack Kirby's more famous quotes, "life at best is bittersweet," originally uttered by Darkseid in Mr. Miracle #18. 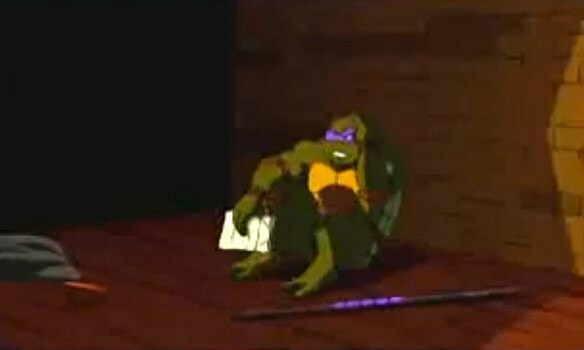 As strange as it is after the silliness of the 20 minutes that led up to it, the image of a distraught Donatello sitting in a dark room, mourning his new friend with only art to remember him by actually adds a surprisingly emotional gut-punch to the whole story. 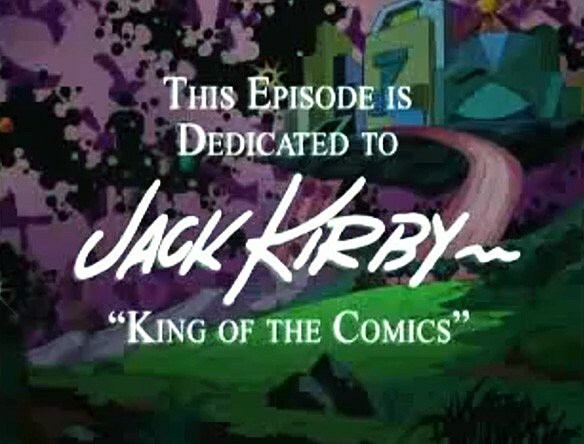 When you get right down to it, the fact that Kirby's lost forever to us, but that he lives on through the world that he created with his imagination is a pretty great tribute to the man the character was based on.